Healthier employees are happier employees. 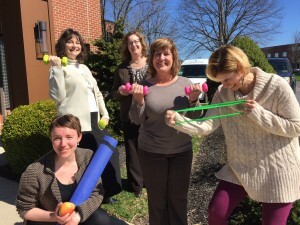 The GKH partners believe that when staff and attorneys make regular, vigorous activity part of their lifestyle, the result is healthier employees, fewer sick days, and a higher level of job satisfaction and productivity. They not only believe this, they actively participate themselves and provide financial incentives to staff to do the same. March 20 marked the beginning of the 12-week Spring 2017 wellness program. Wellness at GKH is nothing new. Individuals still try to log a consistent level of activity per week, and receive a monetary bonus based on activity level achieved. This year, however, the program received a makeover in the form of a team quest component. Four teams of six members each are competing to see how far around the world they can travel. Each minute of activity the team logs represents one mile along the route. By the first reporting date of March 27, most teams ended up somewhere between New Orleans and Acapulco. Very ambitious teams have the Panama Canal in their sights. One of the teams, which values mutual encouragement and regular, judgement-free activity over competition, is taking a more leisurely journey together. The goal of the program is to have fun, make regular activity a habit, and enjoy some vicarious travel to exotic locales. Competition is optional, but always friendly.